The fiftieth anniversary of the X-Men was, of course, an event to be celebrated! In 2013, the current stable of main X-Men writers – Jason Aaron, Brian Bendis, and Brian Wood – got together to write up the celebratory event. The original concept was Jason Aaron’s, building on concepts he’d played with before in his popular ‘Wolverine and the X-Men’ (most notably in #29). The idea was simple: a year earlier, when he began writing ‘All-New X-Men’, Brian Bendis had brought the past into the present – the original X-Men were now living in the present-day. 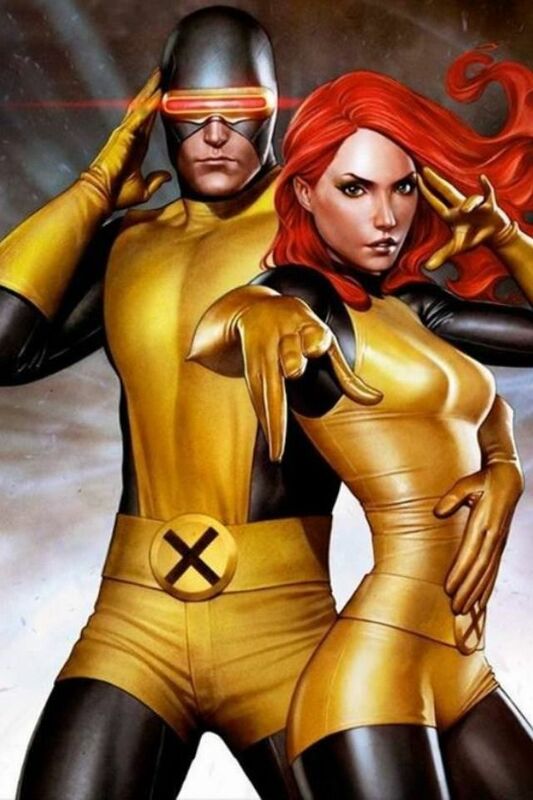 Now, Aaron proposed bringing the future of the Jean Grey School into the present day as well. To celebrate their fiftieth anniversary, the X-Men’s past, present and future would collide! The arc certainly had some brilliant artwork! I get a lot of questions about this: Where would you see yourself in 10 years or what do you think the 12-year-old version of you would think of this? It seems to be on a lot of people’s minds. When the X-Men are faced with all of this, you can’t help but second-guess or really take hold of the choices you’re making in life, and some people don’t. They don’t really think about the choices they’re making, or you see someone in a relationship with someone and you go, “Really, that’s what you want in your life?” The X-Men can really show that to people in examining your future and such. When I was in college, I saw people not even sure why they were in the major they were in. I’ll never forget, one of my neighbors was an astrophysicist, and he was sitting on the porch and he goes, “I hate astrophysics. Why am I doing this? I don’t like it.” And he was only a year away from graduating. The guy’s haunted me all these years. The X-Men are that to me. Is this what you want? Do you want to be a teacher or do you want to be a fighter? Do you want to be a revolutionary or do you want to be a superhero? These are the questions that will be answered in Battle of the Atom. The arc spanned the main X-books, namely ‘All-New X-Men’, ‘Wolverine and the X-Men’, ‘Uncanny X-Men’, and ‘X-Men’. It frequently depended on shock twists and turns, and Marvel played a very clever game; although sketches of the mutants who identified themselves as the future X-Men were released, the identity of Xorn wasn’t revealed until ‘All-New X-Men’ #16 hit the stands. When young Cyclops almost dies in battle with the Sentinels, the X-Men finally conclude that it’s dangerous having the past X-Men living in the present day. As they engage in heated discussion, they are interrupted by the arrival of a group of mutants who identify themselves as tomorrow’s X-Men, and who insist that the All-New X-Men must be sent back in time. 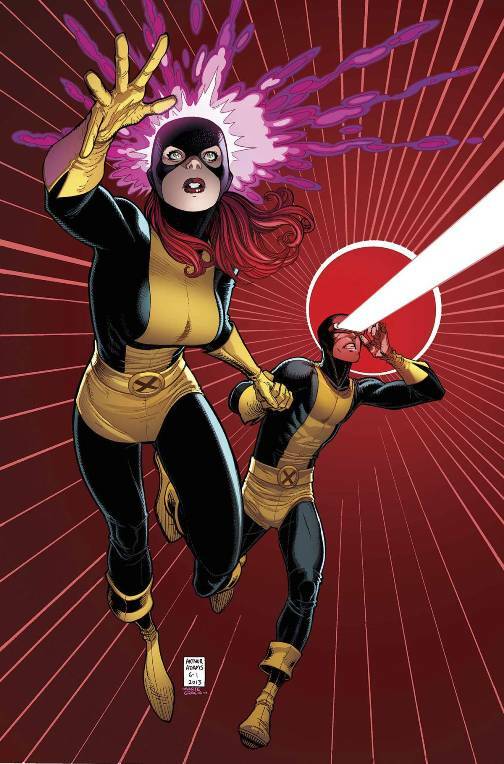 Young Cyclops and Jean go on the run. Upon learning of the future X-Men, Magik takes young Beast and young Iceman into the future, where they learn that the so-called X-Men who have arrived in our time are actually the Brotherhood! Returning, they bring the future X-Men with them, but the All-New X-Men are captured. 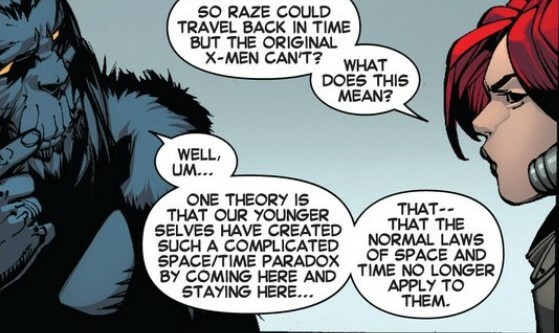 To the Brotherhood’s surprise, they are unable to send the All-New X-Men back in time – their version of Beast theorises that time is somehow damaged too severely. The Brotherhood rig a final confrontation at the disused aircraft base where the X-Men originally fought Magneto back in X-Men #1, and the clash is interrupted by the arrival of S.H.I.E.L.D. When the Brotherhood hijack S.H.I.E.L.D.’s systems, it is revealed that S.H.I.E.L.D. are behind the Sentinels that have been plaguing the Uncanny team. With the Brotherhood defeated (and several members dead), the future X-Men return to their own time, leaving only Kymera behind. Kitty Pryde and the All-New X-Men choose to go with Cyclops’ team. As is common for events, Marvel solicited a range of their best artists for variant covers, some of which were truly gorgeous. The arc is absolutely soaked with continuity nods, and is a true homage to X-Men continuity. Artists in particular enjoyed paying homage to famous scenes of X-history, and the plot deliberately wove itself around locations that are key to X-history, such as Utopia. Unfortunately, each writer tended to have their own focus, and that sometimes caused conflict; the plots raised by Wood in ‘X-Men’ #6, including his focus on Jubilee, were poorly handled by Bendis in ‘Uncanny X-Men’ #13; Aaron paid them even less service in ‘Wolverine and the X-Men’ #37, where the major plot-point of Wolverine’s near-fatal injury is dealt with off-panel and with a quick bit of explanatory dialogue. 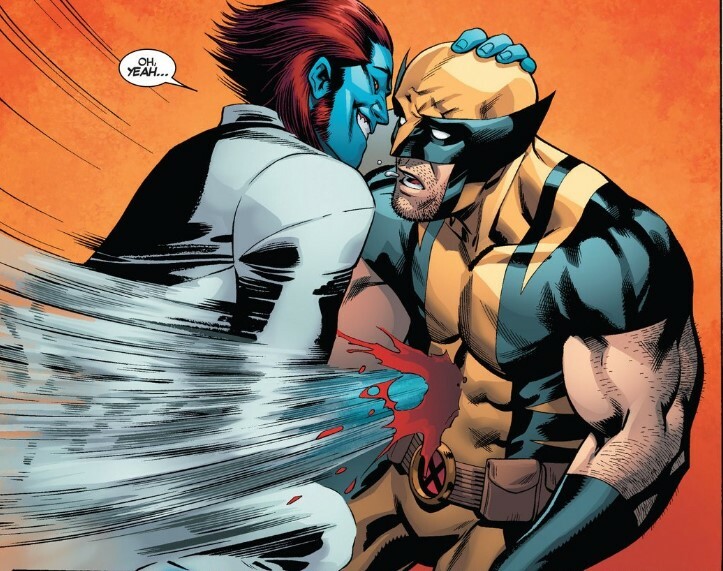 Since Wolverine had no healing factor back then, this gut shot should have been a big deal! 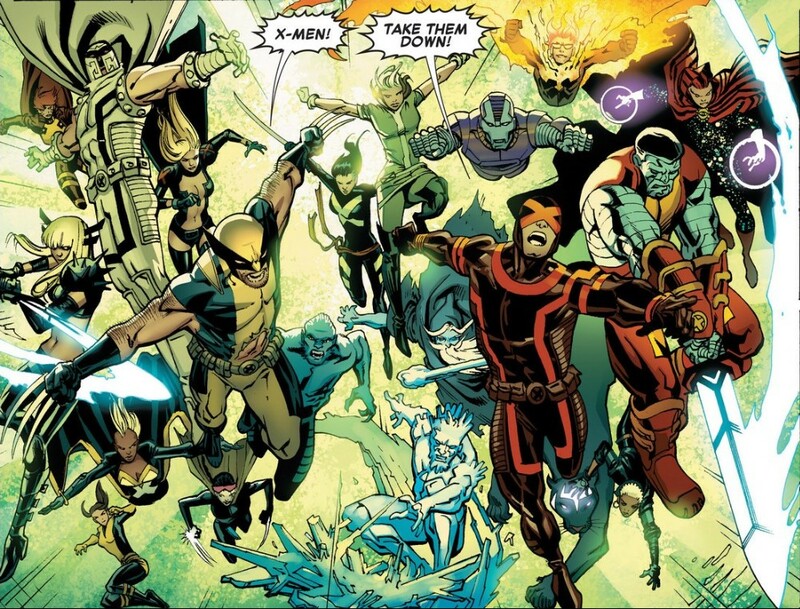 Although the issues sold, fans criticised the arc because it simply didn’t have much of an impact, especially considering the amount of hype; X-fans are used to events being a trifle more spectacular in scope, and the only real impact was that the All-New X-Men switched over to side with Cyclops rather than with Wolverine. The only deaths in the final issue were of future heroes and villains, which – again, especially after hype – seemed a little like taking the easy way out. 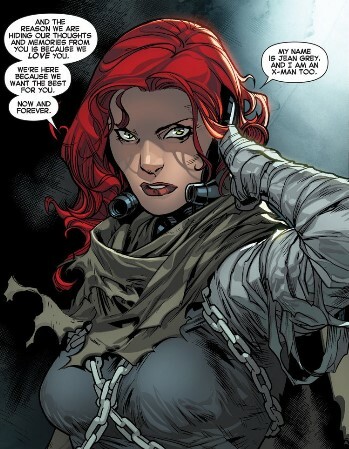 With the benefit of hindsight, Kitty’s leaving was a terrible blow for Wood’s ‘X-Men’ book, especially accompanied by editorial restrictions on using Rogue given her apparent death in ‘Uncanny Avengers’. Adjectiveless ‘X-Men’ under Brian Wood never seemed to recover as a title. And more recently, Bendis has revisited – and rewritten – the future Brotherhood in the ‘One Down’ plotline. Unfortunately, his rewrite contradicts this event, where, for example, the presentation of Xorn is markedly different. Ultimately, ‘Battle of the Atom’ will never go down as one of the greatest X-Men crossovers; it is far too character-focused for a major event, and there are simply not enough consequences. The arc relies too heavily on shock surprises (which, in the main, I’ve carefully avoided in case you’ve not read the arc). That being said, it’s a fun read as a character study, with a lot of moments that seem to be fondly remembered.